The end of summer marks a great event for beer lovers, the annual hop harvest. It is an exciting time filled with a buzz of activity on the hop farms. The hop plants, called bines, are cut down and stripped of their cones (hops). These cones are used in beer for their flavor, bitterness, and preservative properties. Once the cones are harvested they will quickly deteriorate if they are not dried thoroughly. This is a necessary step, ensuring they can be preserved for later use; Stale or rotten hops have no place in good beer. There is, however, a fairly recent development in the brewing world where brewers use freshly harvested hops in their beer. This is a once-a-year brew and offers something truly unique. Like many perishable goods, hops are intensely aromatic when “ripe” and fresh. They contain a delicate bouquet of volatile oils and aromatics, some of which will be lost when hops are dried. When fresh hops are used, the beer is packed with very vibrant, fresh, and resiny characteristics. These fresh properties are typically used in beers that showcase hop flavors, like IPAs and pale ales, and produces ales packed with hop goodness. Drying hops for later use helps to seal in these flavors, but once a year brewers have access to fresh hops and seize the opportunity. However, there has been some confusion as to what to name this seasonal delight. Is the beer made with newly harvested, unprocessed hops wet hopped or fresh hopped? Wet hopped seems fairly self explanatory, expressing the hops have not yet been dried when used. Fresh hopped can reasonably describe this as well, or also mean the use of the first freshly dried, processed hops of the season (this usage of “fresh hopped” has occurred historically). Either way, both terms are used to describe the use of the year’s freshly harvested hops, dried or not. To be safe, if you want to try a beer definitely made with undried hops, look for a wet hopped beer. With great flavor and seasonality aside, it’s important to consider the effort that goes into a beer like this. Firstly, freshly harvested hops are ideally used the same day they are picked. As hop farms are rarely found next door to breweries all the delicious local wet hopped beers are made possible by diligent hop farms harvesting and delivering to ready brewers. This is made more challenging by the reality that wet hops are mostly water and 10X the normal weight is required for a brew. This makes for a challenging, but also exciting, brewing endeavor. The results can be downright amazing if everything goes right and the logistics line up. Since the craft beer scene is taking off in BC, there has also been a boom in hop farms to meet the demands of hop-hungry brewers. For a long time most independent breweries in BC could only source wet hops from Sartori farms. This is no longer the case, as some breweries like Crannog Ales and Persephone Brewing are opting to grow their own hops. Others team up with smaller producers to get their share. Some hops are even grown within city limits! 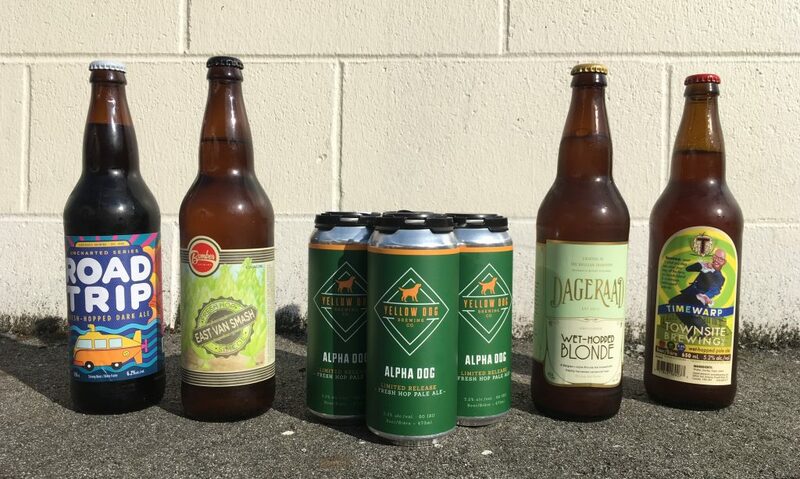 These once-a-year beers have the added bonus of creating closer relationships between brewers and hop farmers; certainly a good thing for craft beer scene. In the end, all the new breweries and hop farms provide us with a much more varied approach on what wet hopped beer can be. Some stick to usual suspects like wet hopped pale ales and IPAs, while breweries like Dageraad choose to wet hop their classic Belgian blonde. Just remember that the window of opportunity is very small when it comes to these summer-end treats. So when you see some, grab it! You will not be disappointed. Otherwise you might just have to wait until next year. Every drink is an experience. Happy hunting!